For forthcoming or past events, or previous WHAI conferences, please see our events pages. If you would like to share WHAI member news, please contact us. The CFP for our WHAI 2017 annual conference at NUI Galway is fast approaching. Please click here for further details and submit an abstract by 20 January. Sinéad McCoole, historian and member of the Government Expert Advisory Group on the Decade of Centenaries. Many of you will be familiar with Sinéad’s work, including Easter Widows, No Ordinary Women: Activists in the Revolutionary Years 1900-1923, Guns and Chiffon, Women Revolutionaries and Kilmainham Gaol, amongst many books. Our President, Jennifer Redmond will MC the event and it will be followed by seasonal refreshments. Looks set to be a wonderful event! Hope to see you there. The WHAI Annual Conference will take place at NUI Galway on 21-22 April, 2017 and is being organised in association with the Irish Centre for the Histories of Labour and Class. The theme of the conference is ‘Gender and class in Ireland’ and papers are invited from a wide range of time periods across the island of Ireland. Confirmed keynote speakers include Professor Carolyn Steedman, Professor Marie-Louise Coolahan, Dr Lindsey Earner-Byrne and Dr Sean Brady. Abstract deadline is 20 January, 2017 and abstracts should be submitted to Dr Sarah-Anne Buckley. Please see the poster below for further details. The thesis-in-three symposium will take place on 25 October, 2016 from 3 to 5pm at Boston College. To download the programme, please click here. The WHAI annual conference will be held at Queen’s University Belfast on Friday and Saturday 11-12 March 2016 and will focus on the theme ‘Irish women and rural society, from medieval to modern’. The programme promises a wonderful mix of academics, museum curators and professionals, postgraduate students, genealogists and independent scholars. The conference is being organised locally by Elaine Farrell, Leanne McCormick and Mary O’Dowd. For further details on the conference programme and registration, please click here. The WHAI is pleased to announce the outcome of the Anna Parnell Travel Grant Prize for 2015. The committee decided that the prize is awarded jointly to Bláthnaid Nolan (UCD) and Maeve O’Riordan (Maynooth University). We would like to congratulate both very worthy winners and thank the other entrants whose applications were also to an exceptionally high standard. We look forward to announcing details of the 2016 competition in due course. The 2015 WHAI Annual Conference will take place on 10-11 April 2015. For the Call for Papers, please click here. The deadline for abstracts is 30 November 2014. See our grants and prizes page for details. The organising committee for the WHAI 2014 conference, Cumann na mBan 100 would like to announce that registration for the conference is now closed. The main delegate list was filled last Friday and the standby list on 31 March. For those who are disappointed, remember you can still join us at Glasnevin Cemetery on 2 April at 11am for the National Commemoration of Cumann na mBan. 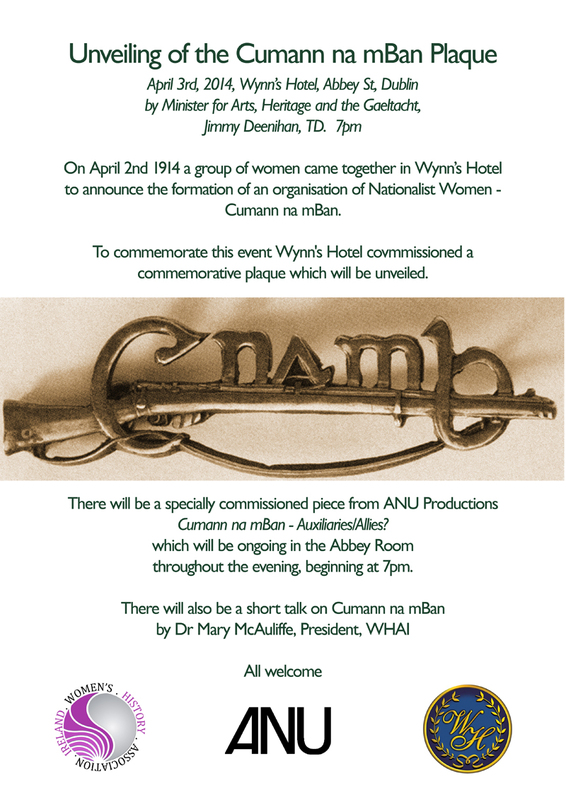 Alternatively you can come along to Wynn’s Hotel in Dublin at 7pm on Thursday 3 April where the Minister for Arts, Heritage and the Gaeltacht, Mr. Jimmy Deenihan TD will unveil a plaque in honour of Cumann na mBan. WHAI Cumann na mBan centenary events about to commence! After months of planning, emailing and head-scratching, the big week has arrived and the WHAI is ready to begin commemorating the 100th anniversary of the foundation of Cumann na mBan. This week will see a range of exciting events commencing on Wednesday morning, 2nd April at Glasnevin Cemetery when President Michael D. Higgins will be joined by members of the Defence Forces to lay a wreath at the grave of Elizabeth Farrell. Winner of the 2013 Anna Parnell Travel Grant: Emma O’Toole, National College of Art and Design, Ph.D candidate. The research project is entitled: ‘The means to promoting health, strength and beauty to their offspring’: An examination into the material culture relating to breastfeeding in Ireland, c. 1680-c.1830. The WHAI warmly congratulates both well-deserving winners and looks forward to hearing more about their research in the future. WHAI member, Dr Catherine Morris, published her monograph Alice Milligan and the Irish Cultural Revival (Dublin: Four Courts Press) in 2012 after a successful exhibition at the National Library of Ireland on the same topic. The winner of the MacCurtain/Cullen Prize in Irishwomen’s History 2012 is Celine Connell, who graduated in 2011 with an MA in Modern Irish History from TCD. Celine was a publisher of financial magazines in London up to 2003. From 2006-2011 she undertook an English and History undergraduate degree at TCD and subsequently pursued her masters in modern Irish History. At the time of winning, Connell was studying for a Postgraduate Diploma in Education at UCD. The WHAI would like to congratulate Celine on her success. We wish David and Laura the best of luck in their research projects. The 2012 WHAI annual conference, hosted by Irish Studies, Mater Dei Institute of Education (DCU) will be held on the 25-26th May, 2012 in Mater Dei. The theme of the 2012 conference is ‘1912: Irish Women before the Revolution’. Proposals for papers should be approximately 500 words and must be sent to Dr Leeann Lane and Dr Mary McAuliffe at whai@materdei.dcu.ie by the 24th March, 2012. The winner of the 2011 MacCurtain/Cullen Prize in Irishwomen’s History is Bláthnaid Nolan, UCD. Bláthnaid is currently a PhD student at UCD Women’s Studies Centre, School for Social Justice UCD. 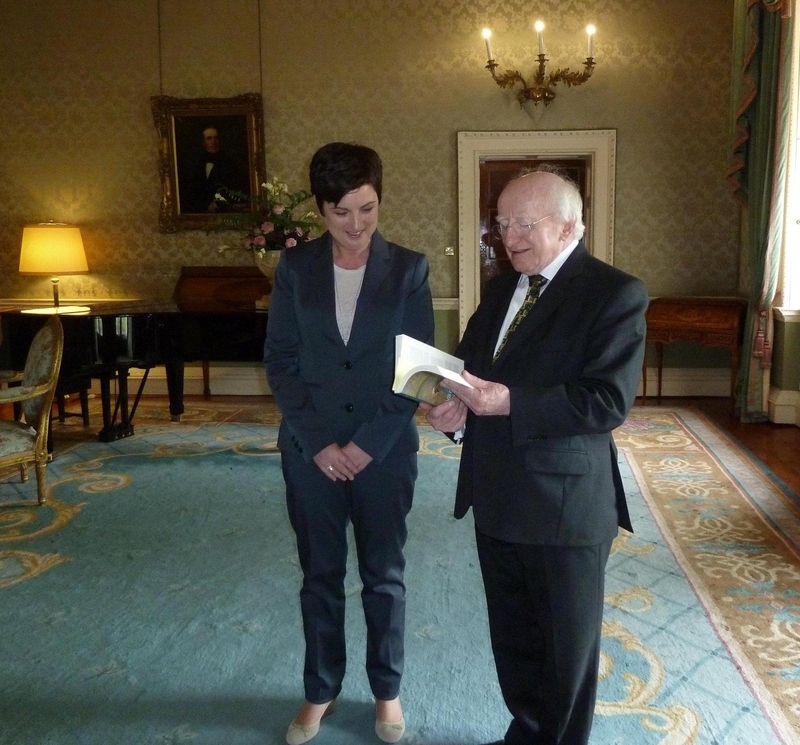 She is an IRCHSS Government of Ireland Scholar. Her research is on female transportation of Irish women to Australia in the mid 19th century, using the Grangegorman Women’s Prison archives. Her winning essay is based on her MA thesis ‘Disposal of Bodies: Transportation as a system of Recycling Irish Convict Women to Van Dieman’s Land’. 2011 saw the publication of a special edition of the labour history journal Saothar (Journal of the Irish Labour History Society, no. 36, 2011) based on the ‘Bread and Roses’ conference in held jointly by the Irish Labour History Association and the WHAI in Dublin in October 2010. The journal was edited by previous WHAI executive committee member Mary Clancy and her colleague John Cunningham and contains a number of contributions from WHAI members including past president Mary McAuliffe’s essay on an important piece of legislation in the history of twentieth-century women’s working lives, titled ‘The Irish woman worker and the Conditions of Employment Act, 1936: responses from the women senators’. To see an image from the launch of Saothar, no. 36, click here. Mary Clancy also published another article of a more contemporary nature, ‘An equal and just society? Towards recovery: The programme for a national government (2011-2016)’, which appeared in in The Citizen, Issue 4, in September 2011. Mary is also involved in the re-issue of Fanny Taylor’s Irish Homes and Irish Hearts (1867) to be published by UCD Press Classics Series. WHAI member Clara Cullen has produced work on the history of women and the sciences in 2011, a much neglected topic that is beginning to receive greater attention as the field of medical history widens. In 2011 she published ‘Women and the pursuit of scientific knowledge in mid-Victorian Dublin’ in Donna Spanding Andreolle and Veronique Molinari (eds), Women and Science, 17th century to the present: pioneers, activists and protagonists (Newcastle upon Tyne: Cambridge Scholars Publishing, 2011) and a collection, edited jointly with Orla Feely, The building of the State: science and engineering with government in Merrion Street (Dublin, University College Dublin, 2011), which contains a number of essays on female science and engineering students and female professors in the Royal College of Surgeons Ireland and Univeristy College Dublin. WHAI member Margaret Ó hÓgartaigh published a number of books and articles in the field of women’s history, including Quiet Revolutionaries: Irish Women in Education, Medicine and Sport, 1861-1964 (Dublin: The History Press, 2011), ‘The Diary of Dr. Kathleen Lynn, 1919-1921’ in The Irish Sword, Winter, 2010, and ‘Irish Nurses in England since World War II’, in Klaus J. Blade, Pieter C. Emmer, Leo Lucassen and Jochen Oltmer (eds), The Encyclopedia of European Migration and Minorities: Since the 17th Century to the Present (Cambridge and New York: Cambridge University Press, 2011). Clare O’Halloran of University College Cork examined the history of scholarly recognition for women in ‘”Better without the Ladies”: the Royal Irish Academy and the Admission of Women Members’ in History Ireland, 19:6 (Nov./Dec. 2011). For those interested in literary history, Sharon Tighe-Mooney published ‘Exploring the Irish Catholic Mother in Kate O’Brien’s Pray for the Wanderer’ in Eamon Maher and Eugene O’Brien (eds), Breaking the Mould: Literary Representations of Irish Catholicism. Reimagining Ireland Series (Bern: Peter Lang (Oxford), 2011). The winner of the 2010 MacCurtain Cullen Prize in Irishwomen’s History is Mary Gibbons, University College Cork. 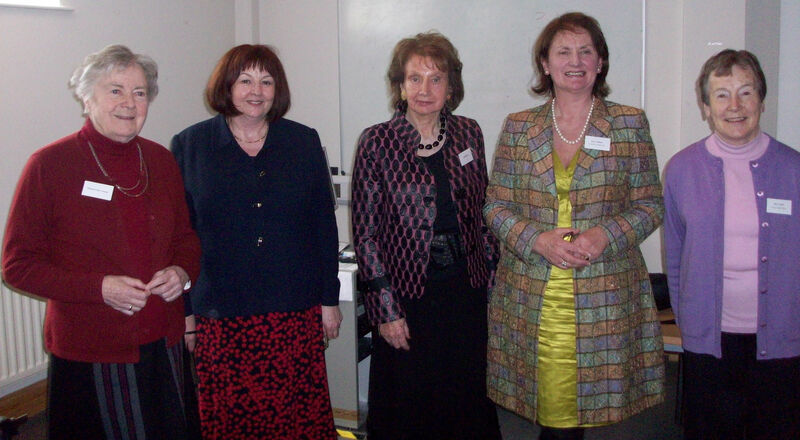 Mary was presented with her prize at the WHAI annual conference, held at Queen’s University Belfast in 2010, and is pictured above second-right with left-right Margaret MacCurtain, her supervisor at UCC Sandra McAvoy, Ann Gibbons, and Mary Cullen. We wish Mary all the best with her future research.